This is a 36-hole par 3 event, played by two-person teams. All 36 holes are played at Heritage Hills. The morning round is a better-ball of the twosome; the afternoon round is a scramble of the twosome. Combined scores of AM and PM rounds are used to determine the winners. CLOSEST TO THE PIN PRIZES WILL BE AWARDED FOR ALL 18 HOLES DURING THE AM ROUND AND ALL 18 HOLES FOR THE PM ROUND. Beat the “Celebrity Pro” holes in the Morning Round. 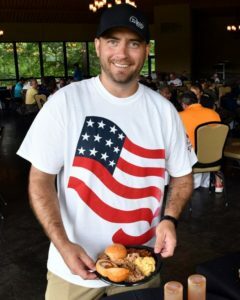 We are happy to announce Gary Sutton from WSBA Radio and “The Gary Sutton Show”, and Todd Sadowski, Sportscaster for Fox 43 will be our “Celebrity Pros” during the morning round. This is our second year to have a special event where our local teams from our Legions and Posts will be competing for the Commanders Cup. 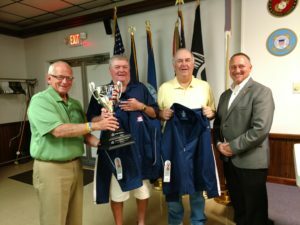 Seen in t he picture is the winning team from Hellam VFW Post 745 – Fred Winters and Bill Goad receiving the traveling trophy and their individual awards from the 2017 event. Also pictured are Brock Hively of RBC Wealth Management, and Duff Forsythe, Total Golf. 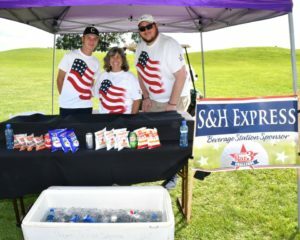 Thousands of Dollars given away in Cash – Prizes – Gifts for all golfers!